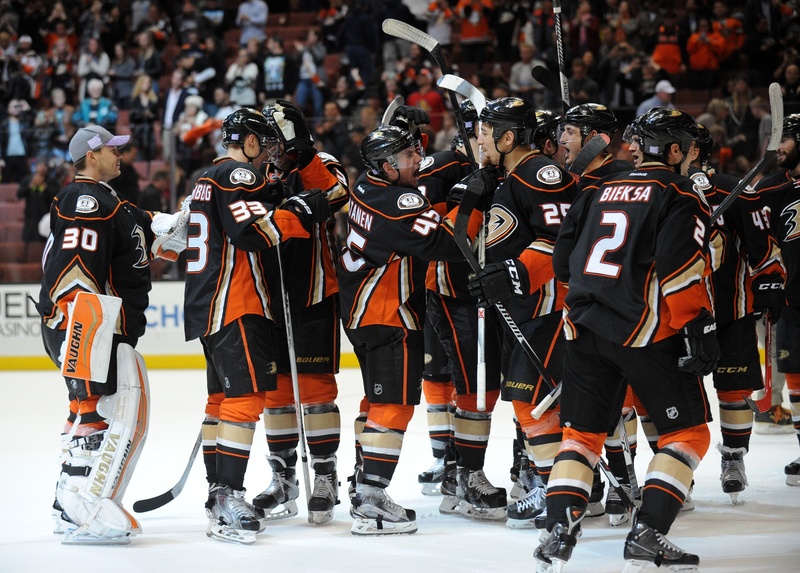 It wasn’t long ago that we were wondering what was up with the Anaheim Ducks. Head coach Bruce Boudreau was on the chopping block, apparently, and nobody knew what to make of Corey Perry or Ryan Getzlaf. The Ducks have turned things around and are now 5-7-2 on the year, running up a 5-4-1 record over their last 10 games. That may sound unremarkable, but when you consider that the team started the year 1-7-2 it starts to even out a little. On Saturday, they knocked off the San Jose Sharks and picked up their fourth straight victory. Indeed, the Ducks were in tight before things even got rolling and struggled to get points out of their big stars. Back on October 24, they’d only scored six goals. Perry was without a goal in seven games, as was Getzlaf. Now, the Ducks still trail the league with a mere 21 goals scored. But they’ve also only allowed 32, which makes them the second stingiest team in the Pacific Division. The Los Angeles Kings, as of press time, have allowed just 29 goals against. Getzlaf, returning from an appendectomy, seemed back in form alongside Perry. He now has five points in 10 games, while Perry has a team-leading eight points in 14 games. The 30-year-old from Peterborough had three points against the Columbus Blue Jackets on November 6, as did Getzlaf. 27-year-old Patrick Maroon has been along for the ride, notching a goal against Columbus and adding an assist against San Jose. That may not last, however, with Jiri Sekac likely to get a look on the top line. So does this mean the Anaheim Ducks are back? Maybe. They’ve got a long way to go to get out of this early hole, but they seem to have at least steadied the ship somewhat. And goalie Frederik Andersen has at least been good, with a 2.03 goals against average and a .935 save percentage. He’s been able to make the best out of a bad situation and has kept the Ducks in it when they likely didn’t deserve to be. While it may not be time to start booking playoff tickets for Ducks, there does at least appear to be a light at the end of this particular tunnel. Boudreau, for the time being, may still have his job and Anaheim may have turned things around in time to prevent ultimate disaster. Whether or not this streak will last is another story, of course.